These Instant Pot Tacos Al Pastor are a convenient spin on a traditional dish native to Central Mexico! 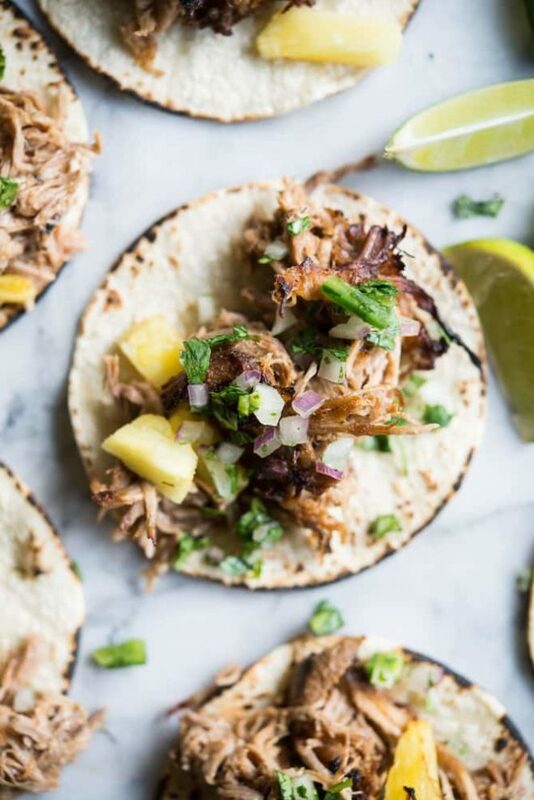 With a fresh pineapple-centered marinade, crispy finish, and fresh cilantro relish, these tacos are a great meal for a family night in or your next hosted party. I'm one of those people who will shamelessly STARE DOWN plates as they walk by. I will lean way, way back to get a glance at what everyone ordered at your table. We all avoid eye contact, but we know what's happening. If you're proud of your order, maybe you lean back a bit so others can really take it in. BUT, as soon as someone picks up a fork, I avert my eyes. Watching you eat would be weird …but drooling over your untouched choices is a little less weird. Snooping what plates hit neighboring tables is how I've discovered so many of my favorite meals! Tacos Al Pastor included. SO, what's up with these tiny tacos? Here's the scoop: they're usually (always? I should've done more research) made with pork. The pork is marinated in a fresh mix to include fresh pineapple and some special chilis for at least a day (but not much longer). 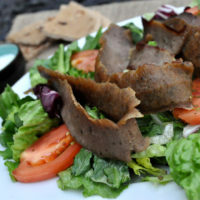 Traditionally, the pork is roasted on a spit and then thinly sliced (think: gyro meat, but Central Mexico-style). Between the cabinet over-stuffed with baby plates (that we aren't even using yet) and the appliances crowding my countertop, I didn't quite have enough room for a spit in our kitchen. SO, we turned to the old miracle worker: the Instant Pot. The Instant Pot is a pressure cooker, slow cooker, you-name-it cooker all in one. 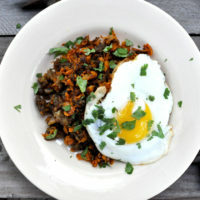 It makes flaky meat (in no time) possible! 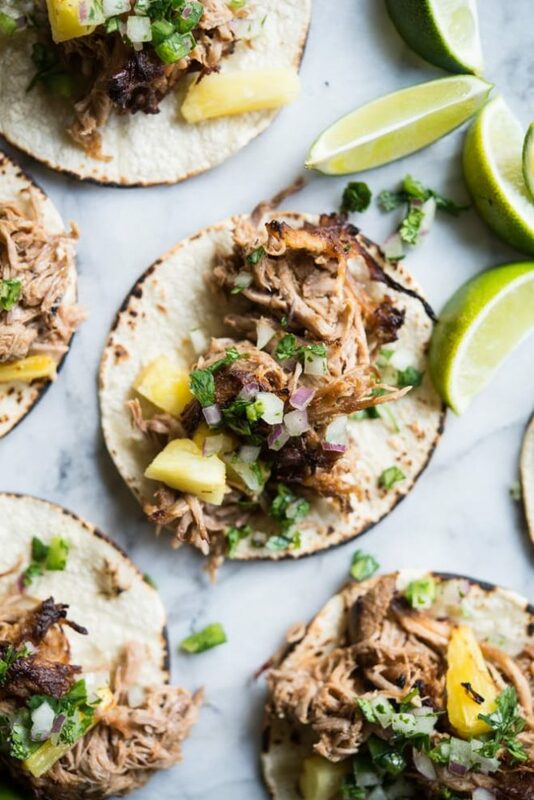 Our marinated Al Pastor meat heads into the Instant Pot and comes out juicy, flavorful goodness. To help seal the deal on a traditional texture, I like to spread this shredded meat out on a sheet tray with some of the extra pineapple. That tray goes into the oven for a little crisping, then, it's taco time! 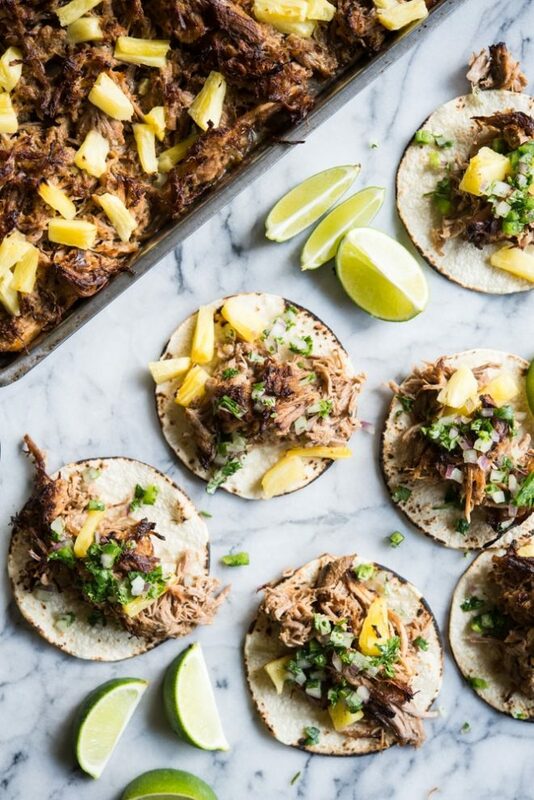 These Instant Pot Tacos Al Pastor are served on mini corn tortillas (you could use jicama tortillas, if you like) that I toasted on the flame on my stove. 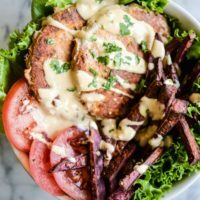 They're topped with a fresh cilantro + onion relish and sit next to some lime wedges just begging to be squeezed over the top. If you love a good beef inspired taco, you'll also love these Slow Cooker Barbacoa Tacos too! They're fresh, delicious, and will feed a crowd (depending on how much pork you make). I hope you enjoy these Instant Pot Tacos Al Pastor! Cut the pork shoulder into 4 pieces, then place in a large bowl. Blend the onion, pineapple, oregano, garlic, orange juice, chili powder, sea salt, and guajillo peppers until smooth. Pour the marinade over the pork shoulder and toss to coat. Cover and refrigerate for at least 4 hours up to overnight. After marinating, add the pork to the Instant Pot with one cup of the marinade. Place the lid on the pot, cover, and make sure the valve is set to sealed. Press the “manual” button and set to cook for 90 minutes. After 90 minutes is up, let the pressure release naturally (about 20 minutes) and remove the lid from the pot. 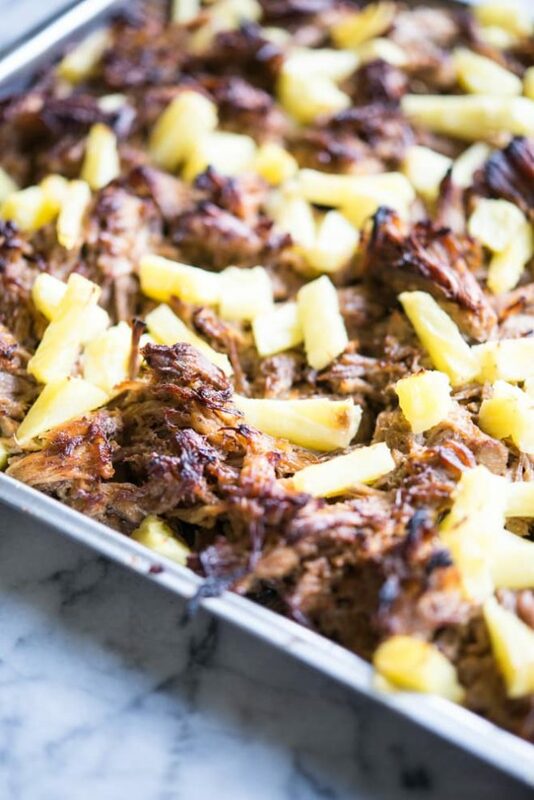 Shred the pork with two forks, then toss with additional cooking liquid, butter, and pineapple, then spread out on a rimmed baking sheet. Place the pan in the oven and broil for 5-7 minutes, keeping a close eye on the pork until it is crisp. In a small bowl, combine the lime juice, diced onion, jalapeno, and cilantro. 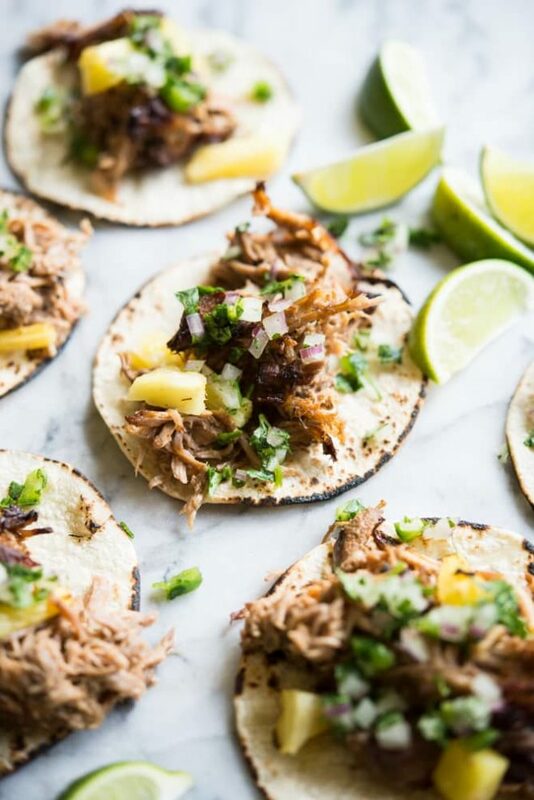 Warm the tortillas, fill with the pork and pineapple, and top with the onion relish and serve! 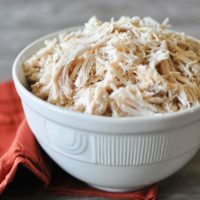 For slow cooker: Marinade the pork, then add to a slow cooker with 1 cup reserved marinade and cook on low for 8-10 hours or high for 4-6 hours until it shreds easily with a fork. The directions mention chili powder but the ingredient list does not say how much. What amount do you suggest? Is the recipe for a bone-in or boneless pork shoulder? Thank you! You can use either! We used bone-in here. Is the IP supposed to be set at 90 minutes on high or low pressure?